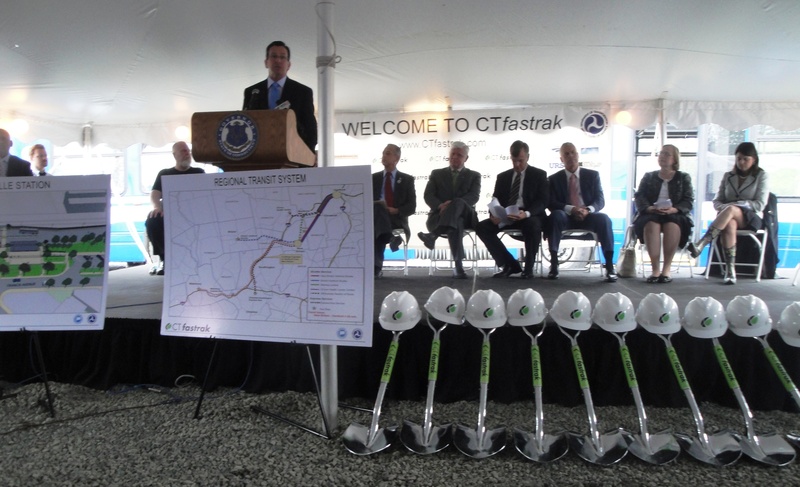 Yesterday, Transit for Connecticut (a program of CFE) attended the groundbreaking ceremony for the New Britain – Hartford Busway, now renamed CTfastrak. Despite the rainy weather, dozens of people turned out for the event from labor, transit, environment, and government organizations to celebrate the day that was over a decade in the making. The press conference featured a big group of speakers including Governor Dannel Malloy, Congressman John Larson, State Senator Terry Gerratana, Connecticut Department of Transportation Commissioner Jim Redeker, representatives from the Federal Highway and Federal Transit Administrations, Hartford Mayor Pedro Segarra, Oz Griebel of MetroHartford Alliance, Mary Glassman of the Capitol Region Council of Governments, and Ed Reilly of the Hartford Building Trades Council. 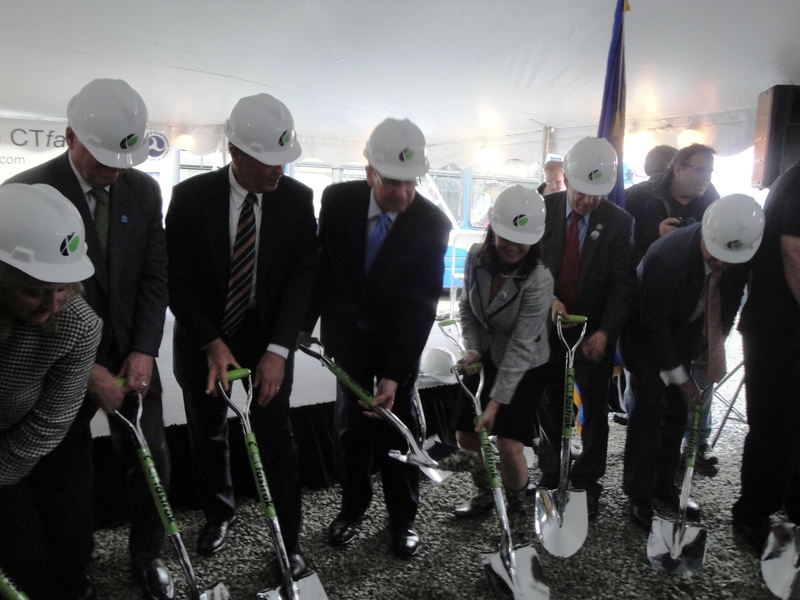 After all of the speeches, the various elected officials donned hard hats and picked up shovels and officially broke ground on the project. 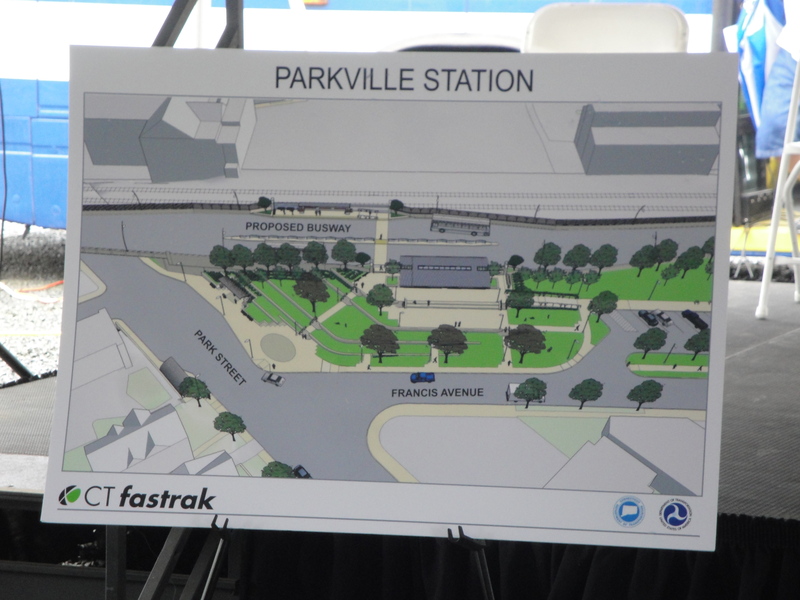 The event was held in Hartford at the site of what will be the new Parkville station along CTfastrak. The Parkville station will be one of the 11 stations along the 9.4 mile bus rapid transit line.